Technology's killing the high street. Are we cool with that? Terrible news for music fans: a much-loved record shop is going out of business. No, not HMV: Aberdeen's One Up, which will cease trading at the end of January. One Up and HMV are very different, of course, but they faced the same problems: the rise of downloading, both legal and illegal; pressure from loss-leading supermarkets and tax-avoiding, subsidy-chasing online retailers; people shopping in suburban retail parks rather than on the high street; rising rents and other costs; people choosing to spend their disposable income on other things... it's a long list, death by a thousand cuts. Here's the problem in a nutshell. Last night, I discovered there was a new compilation of music by Talk Talk, a band I love. I ordered it immediately. From "we browse" to "web browse"
The problem with the high street is that, clothes aside, if you're shopping there you're either mad, panic buying, or ineligible for a debit card. The high street is now where you go to look at the stuff you'll order online later. That was quite cool when only a few of us were doing it, but now we're all at it it's much more depressing. To take just three recent closures, Jessops put 1,370 people out of work, HMV's administration threatens around 4,500 more, and Comet put around 6,600 people on the dole. It's easy to point fingers at the firms and their strategies, but we should also be pointing fingers at ourselves. We can't moan that the high street is full of pound shops, charity shops and pop-up shops if we've been showrooming our way from shop to shop, scanning barcodes and ordering online - but equally when we're all skint and struggling, we'd be mad to pay high street prices when online shopping is so much cheaper. Maybe we need to talk about this, because the money's moving out of the high street at an increasing rate: HMV, Jessops and Comet won't be the last big names to go out of business this year. The effects are enormous: more people looking for work, fewer people paying tax, and less money going into HMRC's coffers because businesses made of clicks are a damn sight harder to tax than businesses made of bricks. I don't know the answers, but I do know where this is heading: the world of Pixar's Wall-E, where a single retailer took care of every human need from birth to death. 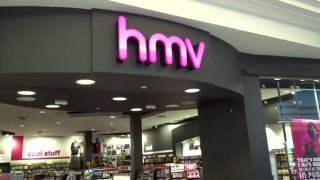 Buy n Large might not exist yet, but every HMV or One Up that shuts is bringing it one step closer.